Right now I’m relaxing at the coast for a long weekend away……. With life being so busy these days it’s nice to take some time to get away from routines and just relax. You should pop over and see what the other Design Team members have made – such creative things they are!!! I've chosen to use Green for my card. On the little flowers I've sprayed some shimmer mist to make them sparkle a little. The slight metallic look ties in nicely with metal paper clip. 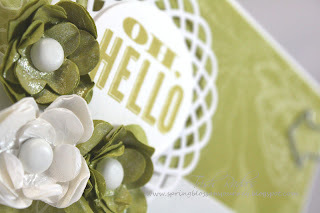 I really hope you find time to play along with us this week so please link up here. Don't forget we are on Facebook too so please Like us so you can be kept up to date with our latest challenges. 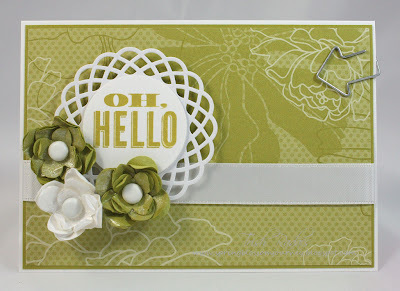 This is a gorgeous, gorgeous Trish - I love that you've used this pretty DSP - I've probably got some hidden away somewhere!